Step out in comfort and effortless style with New York-based label Tory Burch's collection of flats. 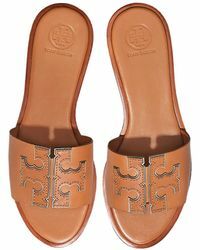 One of Tory Burch's most iconic flats, the cult classic Reva, features the signature double-T metal medallion and comes in a rainbow of bright patents, timeless neutrals and animal-inspired patterns and finishes. Glossy loafers, minimalist leather thong sandals and peep-toe flats complete the selection.